We selected this battle as we had never in the 40 years of gaming at the NSWC, ever played this or any action of 1813-1814 Peninsula. We fought day 1 (28th July 1813) of Sorauren but also included the far Allied (Picton) Right Flank/French (Foy) Far Left Flank. We also had the Portuguese Brigade of Madden from 6th Division appear on the French right opposite Sorauren village (the French were told and only had two moves to do anything about it except they had to follow orders for the bound they saw the Portuguese descending from the hill. The French Dragoon division which was escorting the majority of the French artillery (there were two batteries on the right and two on the left deployed and one in the centre the British had two on their right and one on the right centre deployed). There was also other French cavalry deployed with Foy and British cavalry deployed with Picton. The ground was made up of two ridge lines facing each other, one French, one British, with low ground in between with two rivers and a stream. We used the club version of WRG with 5 players on the French (one was Major Ben just back from the USA where he had been stationed for the last 2 years, it was good to see him again) side and 4 on the British (young Nathan having his first go at Napoleonics and WRG). For the first time in club history we played 10 bounds between 10.30am-1pm and another 6 between 2pm-3.30pm (we were packed and leaving by 4pm). 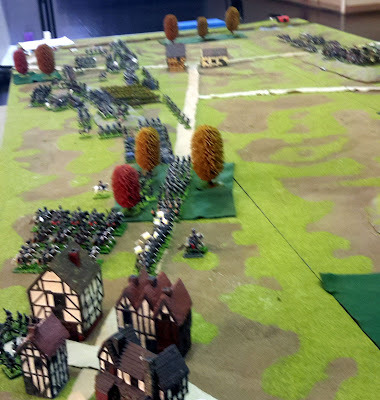 The battle ended with a French victory, the British left flank had collapsed and the centre was not far off, leaving just Picton on the right (getting the better of the French infantry, the French cavalry here was not really used). View from Sorauren village (French right/British left). This is were the battle would be decided.